Resort Homes are professionally-managed homes by our property management affiliates and include the best homes on the beach, the harbour, marshes or maritime forest. Services always include fresh linens and towels, fully-equipped kitchens, starter supplies on household items, professional cleaning and a property manager available should you have any special needs. Send us your email address and we will send you available rentals and /or call you with your options for the dates of your vacation. 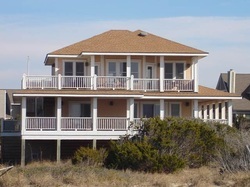 Take the hassle out of your vacation when you rent one of Bald Head Island's "Resort Homes."